Through the powers of modern technology, older machines can now be emulated from the comfort of your PC. While this may help to preserve some of the older games, it's a very dodgy area legally. Although court rulings against Intel have shown chips with generic names (Z80, 68000, 80486 etc.) are free to be copied, and trademarked ones (Pentium etc.) are not, this does not mean that there is a free run of old machines. Although Amstrad & Locomotive Software have released their rights on the CPC and Spectrum, that doesn't give you a free run. Someone still owns the copyright on all the software. Most software houses that are still around have released their rights, realising there's no profit to be made. Theoretically, though, you could still be arrested for pirating a £1.99 game that hasn't been seen since 1985. ROM dumps from arcades are another "grey" area. MAME, which runs the ROMs, is legal. It processes the 68000 etc. end of things, which means the hardware ROMs are OK. But the software ROMs that are needed to play the games are almost certainly still the property of the copyright owners. But, due to copyright laws designed to allow internet caches to be legal, you can probably get away with having the ROMs on your system for 24 hours. I also wonder about games I've already bought home versions of. 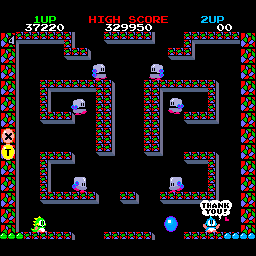 I own Bubble Bobble and The New Zealand Story on CPC cassette, so why shouldn't I be allowed to play these games through MAME? Technically, I can't even use CPE, because cross-format (e.g. tape-to-disk) is illegal without permission. But Taito already have my money for these games: I've paid to use the trademarks, and design. I paid for a different version of the software, which was an additional cost over the arcade original (to convert to CPC). 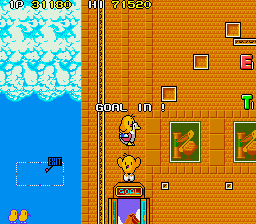 I'm sure Taito put the money Ocean gave them to good use. Also, if they could have made the version I bought arcade-perfect, then they would have done. The fact that they didn't is only down to the machine (one Z80 , not two etc.) it was being run on, and not any deliberate attempt to make the game a lower value than the arcade machine itself. The real issue is whether I am hurting the profits of Taito if I play these games? No. In fact, the last time I was in an arcade I spent all my money on Bubble Bobble. I am more likely to play a game in an arcade that's available for MAME than one that isn't. That's partially because they're cheaper (10 goes on a game from 1987, or 1 go on a game from 1999? Hmm...) and partially because I like playing strange old games. When I was very young, I pumped a lot of my (parent's) money into two arcade games: Pengo and Space Invaders. Pengo was at a hotel we used to have lunch at in Blackpool (when I lived there). Space Invaders was at a family restaurant in Singleton (near Blackpool). If the amount of money I pumped into these two isn't enough to buy me a licence, nothing is. 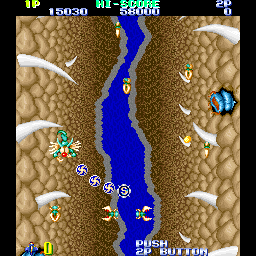 And here's Gemini Wing, another game I already own on a different format. Again for the CPC, bought on the Mastertronic Plus abel. Both Gemini Wing and New Zealand Story would not be used, as those with longer memories will notice, they're both on tape. Although I could have transferred them to disc, using a special device called the Multiface, I didn't due to outrageous 3" disk prices. Yes, that's 3" and not 3.5". Amstrad had the annoying habit of putting a few non-standard components in their machines to sell Amstrad extras. And just look where they are now. Offloading "hi-fis" to Aldi. Actually, Amstrad started out selling the lids, and only later moved on to the rest of the system. Not that anything Amstrad ever made should be called "hi-fi". But the lid joke wouldn't work otherwise. Another thing the Multiface did was allow you to poke memory. This came in very handy, and meant it could fend off competition from Evesham Micro's Disc Wizard, Mirage's Imager and Datel's Action Replay. Datel later made the AR for other machines, ripping off the Multiface's cheat ability and dropping the copying. Running on a CPC emulator, I was particularly happy to get this game back. It's a really simple idea. The ball is either moving left or right. You can move it up or down. When it bounces off something, it changes direction. The idea is to hit the blocks (red/green) without hitting the spikes (green). It's one of those annoyingly addictive concepts. Talking of annoyingly addictive concepts, there was this game I played a few years ago on the Amiga which was just one of those. It was called "No Man's Land", I think. It was top down, with no scrolling, you were on one screen. You, and an opponent ran around, shooting at each other and laying mines until one of you ran out of energy. I want to make a page about all these great concepts that haven't been overdone, unlike Pacman or Breakout clones. Hopefully somebody will see them and write a game using them. It might even be me. So tell me about the simple games you would like to see appear again.